Translating a beloved film to the stage is always a tricky proposition, and Once, an intimate drama about an Irish street musician (Glen Hansard) and Czech pianist (Markéta Irglová) who nurse their broken hearts over a shared passion for music, is not an obvious choice for a Broadway musical. The stage version expands on the film by adding some new characters and tweaking the lead characters a bit — changes that work at times and not at others. For example, Irglova’s character, simply called Girl (played on stage by Cristin Milioti), has become more shrill and meddlesome than she was on screen, a change I didn’t welcome. And in expanding on the film, there’s a bit more dialogue now, so some scenes go on too long. The film’s running time was about 90 minutes; the show is about an hour longer (including intermission). 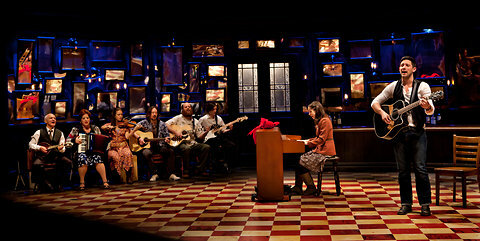 But I love the way the show begins, I love the set and how the whole show appears to take place in the pub, and I love the “gimmick” of having the ensemble also play the instruments, similar to what was done in the recent revivals of Company and Sweeney Todd. It takes some time to warm to Milioti, but when Guy comes around, that’s when I did too. Unfortunately, the night I saw the show, he was out of town. 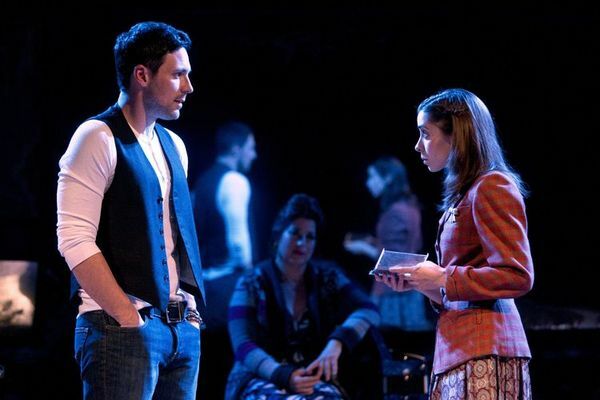 Playing Guy was an understudy named Ben Hope who was making his Broadway debut — and it showed. He looked at times like a deer in headlights, and his performance (and overall look) made the character something a bit less authentic. I’ll have to go back to see the show when Kazee is there. And I would definitely do that. Despite the changes, Once still tells a beautiful story about the healing power of music, and the score — which includes most every song from the movie, and then some — sounds great. 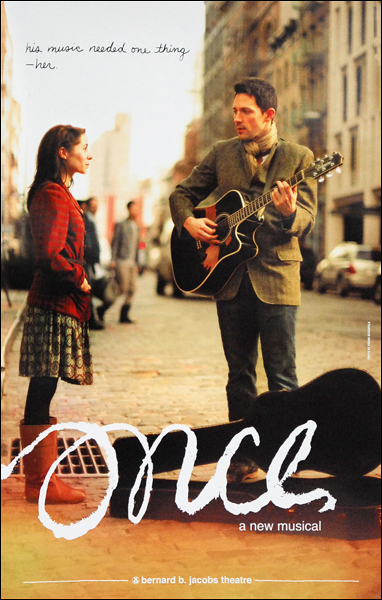 Songs like “Gold” won me over even more so than they originally did in the movie, and the reprise of “Falling Slowly” (the song that won the Oscar for Best Song in 2008) at the end of the show is just gorgeous. 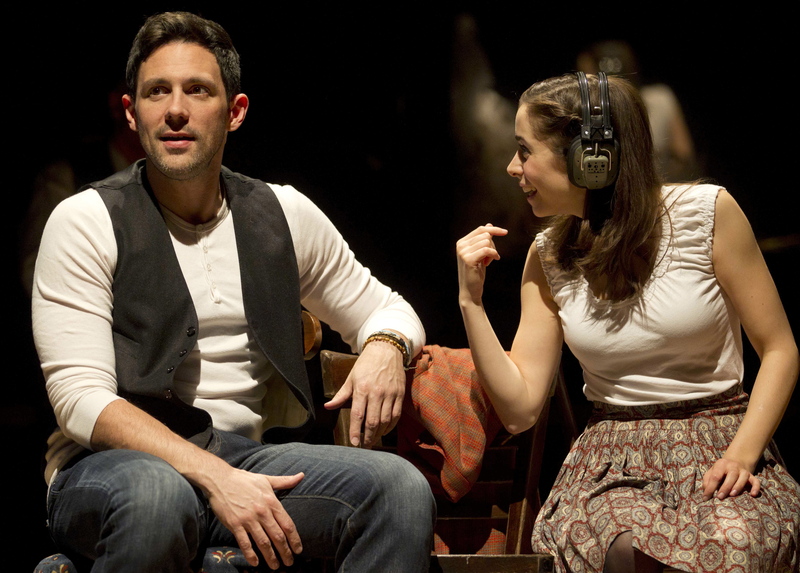 Once tells a story of hope and renewal, and how music can transform the lives of even the most broken-hearted of hoover-fixer sucker guys. It’s a bit of an unconventional Broadway musical, but it’s a wonderful addition to the Great White Way that I look forward to seeing again sometime soon.